Sell Platinum in NYC for Cash Now! 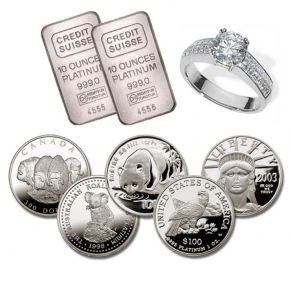 We Â buy all platinum jewelry like platinum rings, jewelry, chains, bars, bullion, coins and more. If you are looking for the best price to sell platinum for you can count on us. We cut out the middleman and refine our own precious metals. The price of platinum has risen in the past dramatically and we want to pay you big bucks for your platinum. The process for selling platinum is simple, you either call or email us for a quote and to set up a time and you come down where we weigh and test your platinum and based on the current price of platinum we pay you cash on the spot. We are located in the diamond district in midtown Manhattan and are NYC’s #1 buyer of platinum and other precious metals.